General Synod 2016: What now? 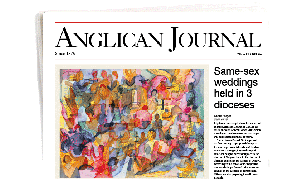 The Anglican Journal is the national newspaper of the Anglican Church of Canada. It is published 10 times a year and carries 23 regional newspapers that provide important local information for Anglican dioceses. The website of the Anglican Journal—anglicanjournal.com—keeps visitors informed with daily news of interest to Anglicans across Canada and around the world.